"What I remember that last time I went for sketch the steam locomotives at Bandel Locomotives Workshop (West Bengal, India). But I was sad to hear that the steam locomotives were obsoleted in India. Those ware disassembled and dispatch for the museum and others for scrap. The year was 1992, after that I didn't do any live sketch of the engine in my scribble book". says Kishore Pratim Biswas... That scribble books had an old memories of indian stem locomotives in 70's. 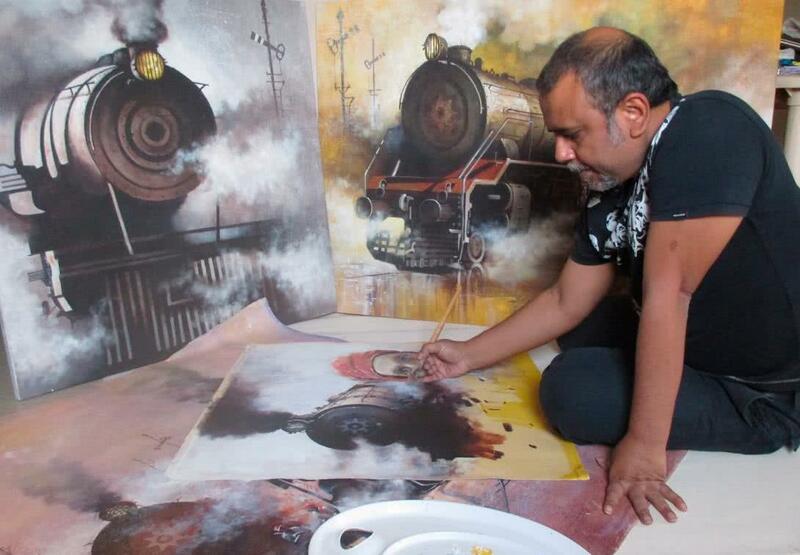 "Even that time I didn't finish my series of "NOSTALGIA OF INDIAN STEAM LOCOMOTIVES".... Yes I had a couple of scribble book on Indian steam locomotives. Which is a inspiration of my work. I did a lot sketch of the Indian railways worker like; signal man, firemen, technical man, divers and other worker. I captured their character, life style and the locomotive workshop. Which represent the mode of Indian railways in 70's. Indian steam locomotives had a unique character. Which very informal and casual look. The locomotives looked very noisy, muddy and rusted, the people were very informal, looking dark and beard face with a red pagri. It's so interesting that is my nostalgia on Steam locomotives" says Biswas. Kishore likes the drawing, when he was in art college, studied portrait and human figures. He loved to observe the light and shade on live object. Kishore crazy to capture the outdoor sequence. In that time he worked on watercolor, pencil, pen and ink. Biswas says "when I sketch any character I want to be act like them... I tried to enter more of the character too... still I habit to work like this..."
"For years, I woke up at midnight and started painting impromptu. I still find that very gratifying." Meet Kishore Pratim Biswas, Indian contemporary artist. Kishore's more than 25-year journey in modern contemporary art movement has not only strengthened his unconventional thought process, but architected his painting style too. Born in Kolkata, 44 year-old Kishore was passionate about art since childhood. After graduating in Fine Arts from Government College of Art & Craft, Calcutta, 1997. Kishore spent some struggling years in his hometown and then moved to Mumbai in 2009. Biswas says "Creating painting makes me emotional. I feel nostalgic from what my experience, with related to contemporary arts, movies, musics, trends, culture and communities... to think how those created. I use to create a series with found content from old sketch books, place and seniors. My painting is mostly about a old affection, ambiance that represent the nostalgia. You can better to say FORM OF A NOSTALGIA."